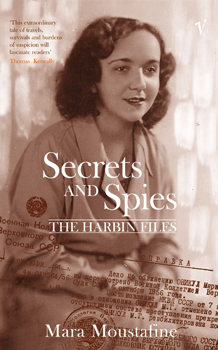 And I have to say, of all the books I read this year, the one I have thought most about, talked most about and continue to think about is Mara Moustafine’s Secrets and Spies – The Harbin Files. Unfortunately, the book is hard to get in the U.S. as it was published in Australia in 2002. My friend in Shanghai gave it to me when I was visiting because I was so interested in the Jewish history in China. (My number one wish visiting Shanghai, except for strolling the Bund, was to visit the former Jewish ghetto area, which we did do.) I started reading Secrets and Spies on the flight back to Chicago, and I was plunged into a vanished world that still echoes in my thoughts. Born in Harbin in Manchuria, in what used to be Russian China, Moustafine’s immediate family emigrated to Australia in the 1950s once Mao’s regime did not tolerate “foreigners” anymore. Her great-grandparents had left Harbin for the Soviet Union in the 1930s, only to be either executed in one of Stalin’s purges, or sentenced to a forced labor camp. In the 1990s Moustafine travels back to Russia and China, and digs through KGB archives to piece together what happened to these relatives. The book’s cover shows her great-aunt Manya, executed in Gorky in 1937 for “spying” for the Chinese. Her only crime, in turns out, was her family background, namely coming from Russian China, and being Jewish. Russian China, and Jewish life in Russian China. I found her unrelenting quest to find the files that would disclose what had happened to her great-grandfather, her great-aunt, and her great-uncle, and all the others immensely admirable. At times I found it hard to read about the terrible fates they suffered, and yet the narrator swept me along on her quest. And all the while I was asking myself: Where does this drive come from? Why is it so important to figure out what happened in the past? Why was she willing to travel thousands of miles, and deal with all kinds of bureaucracies, only to find out where and how someone like her great-uncle was murdered? In part I was asking myself this because I saw my own quest mirrored in Moustafine’s. I also went “back” to my grandparents’ hometown of Reichenberg, now called Liberec, in the Czech Republic, in 2002 to see their house (which is still standing), and to walk their streets, and sit in their café (which was still open then). I have since been back twice, and have perused the archives in Liberec, to figure out, for parts of the memoir I wrote about their lives, what it was like to live there in 1938 when Hitler annexed the so-called Sudetenland, in particular because my grandparents were Social Democrats and thus on the wrong side of the fence when the Nazi frenzy took over their city. Like Moustafine, who was reading through Russian files, I was reading newspaper archives in another language, in my case printed in old German script, which thankfully I can read. I can say for myself that going back and piecing together the past did help me understand what was lost. And why is understanding that important? Because, at least in my case, what was lost has resonated in my life. After being expelled from Reichenberg after World War II, my grandparents brought their culture, and above all, their Bohemian cuisine, to West Germany, where I grew up. That loss of a homeland that my father suffered as a 13-year-old boy put him on the trajectory of venturing out to live in an entirely different culture, namely the U.S., marrying an American, and resulted in me, the next generation, growing up with a sense of being in between cultures, and never quite at home. So, one nudge from the Relish12 blog challenge had me thinking about all this. More importantly, it even had me write to Mara Moustafine to ask her what made her embark on her quest. Writing a letter to an author whose book got me thinking is something I always mean to do, but hadn’t done up until now. So thank you, Relish12, for prompting me to do that! I might follow up with another post if I do hear back from Mara Moustafine. In the meantime, perhaps this question of the most meaningful read of 2012 got you thinking, too? rebecca – I didn't see that coming, either, but once I was writing about this book, I felt I had better let the author know. I'll have to track it down…. William – it is definitely a compelling book.